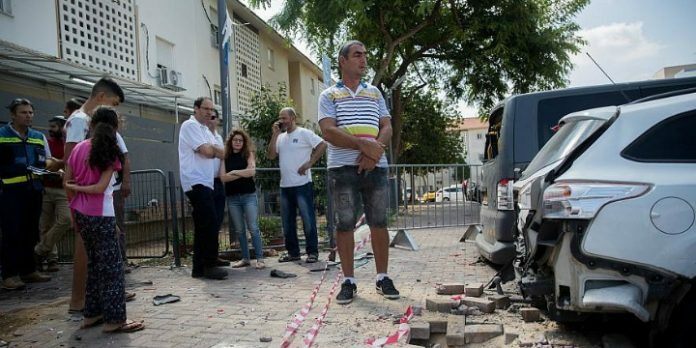 The site where a mortar shell from Gaza hit an apartment building and cars in the southern Israeli city of Sderot, near the border with Gaza, on Aug. 9, 2018. Photo: Yonatan Sindel/Flash90. JNS.org – Members of Congress and the American Jewish community are reacting to the most recent escalation between Hamas and Israel, with the former firing rockets from Gaza into the latter. Similarly, Rep. Eliot Engel (D-N.Y.), ranking member of the House Committee on Foreign Affairs, “strongly condemned” the rocket fire. “I support Israel’s right to self-defense. No one should have to live under this threat, and no country should be asked to sit on its hands while citizens face a barrage of rockets,” Engel said in a statement. Rep. Brian Fitzpatrick (R-Pa.) said that he stands with Israel. Meanwhile, the Jewish organizations expressed their outrage over the Hamas rocket barrage as well as their support. “B’nai B’rith International is outraged by the Hamas rocket barrage against Israel, and we stand in solidarity with the Jewish state,” said B’nai B’rith International President Gary P. Saltzman and CEO Daniel S. Mariaschin. The Conference of Presidents of Major Jewish Organizations also expressed solidarity with Israel. A ceasefire mediated by Egypt was reached between Israel late Thursday evening. “We look forward to the day when the residents of Israel’s south can live in peace and without constant threat,” said Stark and Hoenlein.